This past weekend, on the underside of the Earth, New Zealand was flush with energy. The Rugby World Cup had returned to Auckland, the nation’s largest city, and the All Blacks were poised to win for the first time since 1987. Back then, social media was an unborn concept, but this time around, Facebook and Twitter were an amphitheaters for fans, closely trailed by one up-and-comer: Capture the Flag, a web-based photography application akin to Foursquare that allows teams of users to overtake locations, earning prizes from venues through the popularity of user generated photos. The app and site were developed through Snapr, a photo app launched in March, 2010, whose API enables developers to utilize the app’s driving concept: real-time geotagging of content to a shared map. Whereas a tweeted Instagram photo may list a location, Snapr and Capture the Flag peg the image to that location for a shared visual experience, allowing users to scan and immerse themselves in clusters of documented real-time activity. Edward Talbot and Rowan Wernham, who founded Snapr, released Capture the Flag this past September, adding play to the social experiment by dividing users into teams, then rewarding them for photo check-ins. 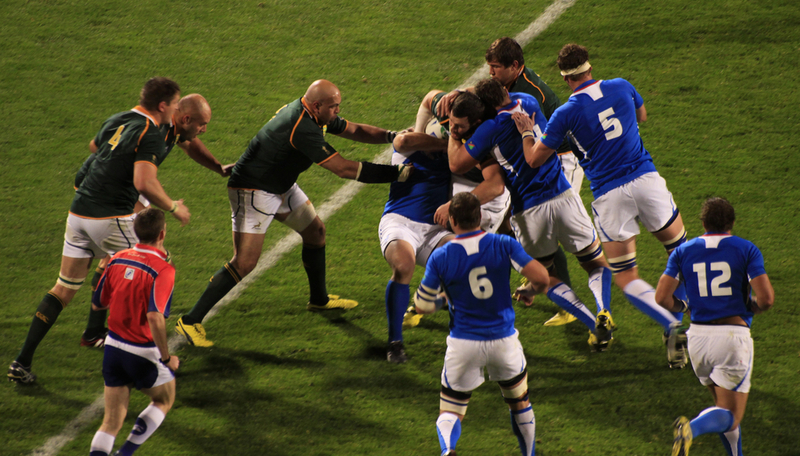 During the course of the Rugby World Cup, Capture the Flag picked up a boost in popularity by expanding its capabilities and emerging as a competitive vehicle for brands, which were invited to integrate the service into their existing social networks. By hosting photo competitions of their own, participating brands saw their products in a highly visual social sphere, one nearly self-perpetuating in that it allows users to interact with one another, just as they do normally in Capture the Flag, through the brand’s Facebook pages. Tourism New Zealand, Moa Brewing Company, V Energy drinks, BurgerFuel, Juicy Campers, Huawei Mobile, 42BELOW vodka, and 2degrees were among those who first saw this service as a leveraging tool for user engagement, rewarding prizes to participants who posted the most popular photos. V, for example, will provide a year’s supply of drinks to 3 winners, while Tourism New Zealand is providing three $5,000 trips to New Zealand and holding a weekly photo contest highlighting 100 tourism destinations. As the World Cup festivities come to a close, some competitions will simply be re-themed – 42BELOW’s current contest, for example, is the Carnival of Fun, rewarding the most bizarre images – thereby solidifying and extending the partnerships. By allowing users to promote and re-post one another’s photos, which can be taken with any photography app, Capture the Flag adds a playful, competitive component to the otherwise heavily-saturated photo app market – all while monetizing in previously unseen ways. “Lots of brands are interested in doing stuff with user generated content – but its really hard to build and market an app from scratch and keep people interested in using it,” Wernham explained. Furthermore, by adding branded teams to the mix, complete with mascots, Talbot and Wernham greatly expanded their channels of communication – throughout the tournament, brands went head-to-head with one another while their users went head-to-head internally. Moa, being the first to offer weekly prizes, is currently seeing the highest level of interaction, and their most active user has posted over 300 photos. Talbot sees this as the early form of a widely-expanding sphere, with major brands – Coca-Cola and Pepsi, he suggests – forming teams of their own, engaging users to establish brand representation, on a social level, at locations around the world. Tourism New Zealand, Talbot said, has set the example for these mobile opportunities, hiring the Capture the Flag team, alongside digital agency Gladeye, to build a custom Facebook app that displays the photos of the game over a map of New Zealand, from which users discover tourism prizes and select their 8 favorite shots. The photographers are then entered into the drawing to win one of 3 trips to New Zealand. The app, as a result, has seen a remarkable level of user attention, boasting thousands of albums and an average time on site of 9 minutes.